Thursday February 7, 2019 - Former Vice President and Wiper Leader, Kalonzo Musyoka, is in trouble yet again after Ukambani Deputy Governors threw their weight behind their bosses' unity. 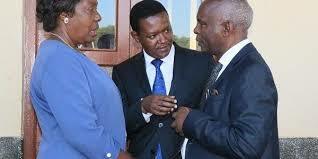 Speaking during a press conference in Machakos town on Monday, Deputy Governors Francis Maliti (Machakos), Adelina Mwau (Makueni) and Nzau Mawathe (Kitui) reaffirmed that they are behind the Ukambani Governors' resolutions on South Eastern Kenya Economic Bloc (SEKEB). Reading the statement on behalf of his colleagues, Maliti lauded Governors Kivutha Kibwana (Makueni), Alfred Mutua (Machakos) and Charity Ngilu (Kitui) for uniting ahead of the 2022 General Elections. He noted that the Governors from Ukambani are on the right track as far as Ukambani politics are concerned. “It's good to note that you cannot do things the same way and expect different results," Maliti said. "We urge our Governors to soldier on and with our support Ukambani will never be bedrock of shame, poverty and disunity," he added.